From time to time I hear predictions made by various people, so to keep track of these I’m starting this new Page. * This page is not just for me to use, it is for everyone, so feel free to add your own predictions here, or predictions that you find made by other people, as long as they don’t mind that you put them here. Get their permission first. * Predictions from people doing interviews etc should be okay unless they say otherwise. * Please provide links to interviews, articles, etc. Astrological predictions from Mark Lerner and Mitchell Scott Lewis. In the interview Mark Lerner said November 1/13 is one of the big days. Mitchell Scott Lewis said April 20/14 for a big event. It’s always best to listen to the interview yourself. You can read about it here http://www.coasttocoastam.com/show/2013/09/12 Everything that was said is Not in there but it’s pretty good. It’s the age of predictions, as it seems. Hi Martijn, Long time no see! Lol! I doubt very much that your prediction will be wrong. But hey, who knows?!! I’m adding this here for easy look up. September 19 through October 14, 2013. John Lash says that he thinks this coming 50th anniversary of JFK’s assassination this November will be a tremendous breakthrough event and he looks to it very positively. At about 1 hr 25 min. My take on this was it is because of the government’s 50 year rule of the truth about certain events cannot be told until 50 years after the fact. Jesse Ventura was talking to John B. Wells on Coast Saturday night about his new book on the horrible murder of JFK and it was quite fascinating. Not being an American I didn’t think of that. However on a recent Coast show I think someone said they are going to hold off on that rule for release and wait for another 25 years to release it. Perhaps it was on John B’s last Saturday show, or it could have been someone else. I might do a search about that later and if they are going to wait 25 more years I post a link. I did a search and I can’t find anything at all about waiting 25 more years. Also I just found this. From the article dated Tuesday, June 12, 2012. “For the prophetic record Isreal I don’t will attack (Iran). What I think will happen though is people underestimate what Barack Obama will do”………….. He goes on to say a warning to Iran – Don’t underestimate this US President. Obama Is like Spock and the if he thinks negociations are dead in the water he will bomb you back to the Stone Age in 2016 so get real with it! Dr Louis Turi was just on Coast. Here are his predictions. Scroll down to Oct 12, 13, 14. 7.2 earthquake in the Philippines October 14, 2013. It looks like Turi nails it again with his predictions. Today there was a 7.3 EQ in Japan and 3,300 people were evacuated because an Indonesian volcano erupts. From Turi’s site at the above link. Scroll way down. October 18, 19, 20 – news from Germany, Army or military in the news, important laws passed. October 23, 24, 25 – thousands forced to relocate because of natural disaster. I might have something to say about this man. The only reason I would say something is because I have been reading his online material since 2001, or even 2000, and had a life reading done by him back in 2005, or thereabouts, which is on audio tape. I have a few of his books, too, and I have a couple of very serious issues with what he is about. I do not know him personally and have never spoken to him, just evaluated, long term, what he teaches and what he says about himself. He’s a strange one alright! Always referring to himself as Dr Turi, telling people how good he is at what he does, trying to get recognition. I haven’t been following him, and pretty much only think about him when he shows up on Coast. Would you mind sharing these “very serious issues with what he is about” ? I didn’t know you were a bible reader. There is a lot of truth and useful info in the bible. But beware! The ways of Darkness can be found there too. Occasionally I pick things up from the bible. No doubt, Salty. Especially the wrathful (false)god of the bible and his tyranny overshadows the entire school of thought called Christianity. The original teachings of ‘Christianity’, which I believe can basically be found more in the true Gnostic teachings or original Christianity that is based on Jesus, the real Jesus, have been corrupted and altered by darkness. The Cathars called themselves ‘True Christians’, for example. I believe that the New Testament can not be understood properly and fully unless one reads the old testament. Also I don’t agree that it’s mainly in the New Testament. Also there is reading the bible, and then there is Reading the Bible. There is a deeper meaning that is not readily apparent by just reading the words. Beloved, do not believe every spirit, but test the spirits to see whether they are from God, for many false prophets (and I add false spirits) have gone out into the world. and at other times I Know it is True and not from the False. It’s absolutely necessary to discern. The New Age often talks about ‘the cosmos’ and other sources that you supposedly have to ask for guidance and such, for example. It’s more likely that ‘the cosmos’ is filled with bad spirits though. Actually I am not an expert at all when it comes to the bible. I only read certain excerpts at times, and don’t really have the entire picture of the bible, like the precise correlation of the old testament with the new testament, and such. The old testament gives me the creeps, mainly because of that god character in it. I’m more familiar with the new testament anyway. Perhaps Bill Donahue provides some interesting insights in Reading the bible more properly. It didn’t give me the creeps, or fear, but I had Fierce Anger, and Revulsion. It took me many attempts over many years before I finally managed to read it. I had to force myself at first and I’m glad I did. A few things you may find helpful if you ever want to read the whole Bible. * The whole rest of the bible is based on the first 11 chapters of Genesis. * The rule of first mention. (an unwritten rule) If you come across something and you don’t understand the meaning, go back to where they first mention it in the bible and go with that meaning. * Read different translations of the Bible. I prefer the KJV Authorized version because 1, I’m used to it, and 2, the wording is difficult and I have to think about the meaning more, look things up, etc, and I get a deeper understanding than I would otherwise. However, reading different translations is definitely helpful sometimes for studying. * If something perks your interest investigate it to the best of your ability to do so within the Bible itself first, then after that elsewhere. You have to listen to the video to hear all his prophecies and the details. Very briefly he says the planet is going to be destroyed, the whole physical is going to fragment, and eventually the universe will be destroyed. The viable ones will continue, that’s about 9% of the entire population. I’m not sure if he says it in this video but he has said (except for the universe being destroyed) that this will happen before he dies. I think he is in his 90’s. I don’t follow Joseph Chiappalone but these are predictions so I’m making note of them. You may want to read under the YT video in Show more. Hi Polly, because YT removed the video at the link you provided I’m putting this link here. I always found the Andromedan aquamarine info interesting because that is my birthstone. Dr. Evelyn Paglini has died. She passed at 8:13am Saturday March 29th 2014. There are links to a couple of interview clips in the article. Evelyn Paglini predictions 2014 but some of it started a couple of weeks ago in Nov.
* An indiscriminate deadly strain of flu. Stomach and chest. * A LOT of snow and deep Freeze cold. * An accelerated Volcanic eruption. * More Hurricanes than in 2013. * Flooding from Florida down to Texas. Evelyn says that we can’t stop these things, but we Can diminish some of it. It’s always best to listen to her. Evelyn is the second guest an her part begins at about 38 minutes. Evelyn has been right about a lot of snow and deep freeze cold for the U S and winter isn’t over yet. Joni Patry 2014 Vedic Astrology Predictions. She says Way more than what I have put below, so, it IS best to listen to her! The below is not necessarily in the order she said them. * “Winter 2013 – 2014 will be one of the coldest winters we have ever had, and the strongest storms”. * Possible epidemic/pandemic/health scare. Which could involve a chemical war? In the first quarter of the year. March? * January, the end of January, February, March something tragic will happen. * USA, something will happen. I think she is saying something will happen in the US closer to, or in July. * January – earthquakes. Jan. 8th is a dangerous date, so stay low. USA, the deficit is not going to be avoided and will create panic. “They will not get away with it for another year” Listen to her. * Around the time of the full moon in Jan 15 it has to do with deception. The truth will be known? * “February things really get intense”. * Middle East breakout in war. * War, intense conflicts all over the world. *To hear what she says about countries and war FF to about 29 min. * March. New moon, this could be a treacherous time for earthquakes in America as well. * More talk of war and something is due to happen in March. * Other dates to watch in March are March 6th and 2nd. * May dates to watch. May 20. * Summer 2014 is a turning point. * November. Big shift on the economy, a change, how people believe and think, people are going to be moving more towards trying to find peace. I’m going to leave your comment here, and put the article link in comments in yesterdays post. Will Something Happen on July 8, 2014?? EDIT Jan 9/14. Go to the link below for an update. JPL astrophysicists plan to bug out from jan.15th onward. At about 58 min. February 2014 There will be an announcement, and the world will change on the date of that announcement. More info and links for “February 2014 There will be an announcement, and the world will change on the date of that announcement.” at the link above in comments. Of course, speculation is all over the place (which I am not really interested in but will just observe, as usual). It appears Courtney has upset a few apple carts and he hasn’t even made his announcement yet. I would say some are trying to make it their own, as in usurp the announcement even though they don’t know what it is. “The Free Dictionary (by Farlex) defines hysteria as “behavior exhibiting excessive or uncontrollable emotion, such as fear or panic.” Hysteria is often caused by people thinking about the unknown. It is rarely caused by a real fear of a real thing. There can be wartime hysteria when people are worried about the outbreak of war, even if war never happens. Children can become hysterical about bogeymen even if bogeymen never exist. Hysteria is fear created by the imagination, not reality. While discussions of the upcoming February “announcement” are very useful, it is not useful for people to become hysterical. The announcement will not be about Earth changes or anything else that would disrupt normal lives. It will be about knew knowledge that will change the way all of humanity thinks of its past, and its present. It will be a moment of profound learning, nothing more, but nothing less. It will mark one of the most important moments in the history of our civilization. Not everyone will agree, but eventually, that is how most people will come to see it. I like the last paragraph on that update. I just seen your (?) comment above. Generic gravatar. I guess you weren’t signed in when you commented. I like that last paragraph too. Thanks again for keeping me up to date. I appreciate it mucho! On Coast Jan 28/14 David Sereda made a prediction about Earth in the future. “That’s my prediction from everything I’ve seen” he said. It’s best to listen to him talk about the prediction. The link to the video and related stuff is here, FF to about 56 minutes, or a little before or after that. Courtney’s reason for posting “implication postings” is to generate discussion before his future announcement is made and that announcement will be posted at his website. http://www.farsight.org/ I understand. This is how a foundation is being laid to support the coming announcement. I’ll be back in a few to put his posting here in comments. I’m looking to see where this post lands in this thread. I’m attempting to have it line up with other posts. No guarantees. I am copying and pasting it from the email as is. 1. This is one of a series of “Implications Postings” that refer to an announcement that will be made during the month of March 2014. 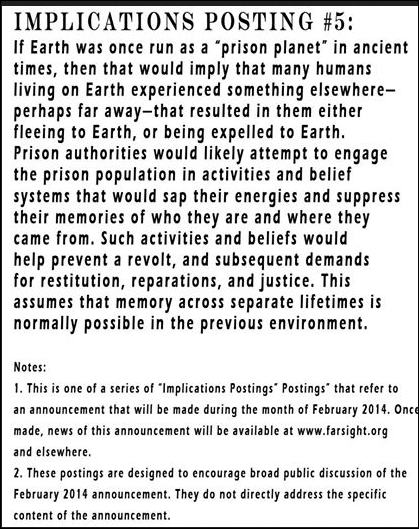 Once made, news of this announcement will be available at http://www.farsight.org and elsewhere. The new timing could be better instead smack in the middle of a Mercury Retro. Yes, Mercury retro is really bad this time around! I’m going to put your newsletters in colour. Go to Polly’s comment below 2014/02/13 at 9:54 PM and click the link there to read a Very Good Interesting article about this by Joseph P Farrell. If this article turns out to be BS I’ll remove it from the Predictions Page, but leave the post up. Polly, Yep! I know you have said it many times and I agree. I’m collecting things to put here in Predictions about something else now, so my mind is in a different place right now, but I think Wynn talks about that in his book. He may say it differently though. I’ll look it up if I have time. He mentions what Catherine Austin Fitts talked about. I could swear the “elite-skis” (made up word) threaten each other by making “predictions” and having the media publicize them. I have an article from Jan Posted about this but it’s a short one. Never hesitate to to put something here because it might be a duplicate! It might have more info or whatever else. It may be here in Predictions somewhere but I don’t have time to look right not. After I read your article and check my blog for other mentions of this then later, when I have time I’m going to put a note in your comment. What happened today isn’t a Prediction exactly, but the attack on the Doves today might be a portend of things to come. I have added a new category, “Omen?”. Coast will probably have Steve Quayle, or someone else on real soon to talk about it. I think Clyde will probably be talking about it on his show too. And I won’t be surprised is Amitakh talks about it in one of her articles. February 3, 2014. Courtney’s latest posting below. Link to Courtney’s FB page posting is in Polly’s Feb 3/14 comment above. For those interested here is a link to what they are saying about this over at Project Avalon. This link goes to page 6. Below this comment you will see a comment by Polly who got Courtney’s newsletter from the Farsight Institute where he makes a correction to Implications Posting # 5. Please read that. I need to make a correction in the previous email with Implications Posting #5. The corrected version is below. But also, remember that with the upcoming February announcement, we are not talking about any kind of Earth changes, presidential revelation, pole shift, ET landing, second coming, end of the world, or anything like that. This is much bigger in its own way. It is just an announcement and the release of information, but information changes worlds more profoundly than anything else. Some will disagree and laugh at it. Some will marvel. But in time, history will show that our civilization changed its direction on the date of the announcement. You will read about it here, and elsewhere. Also, remember that this Implications Postings are only to encourage a broad discussion of all possible aspects that may be related to the announcement. Some will not see the connection, but others may, and these postings will help encourage a dialogue. No one is right or wrong with this. We are just encouraging the broadest possible discussion. If Earth was once run as a “prison planet” in ancient times, then that would imply that many humans living on Earth experienced something elsewhere—perhaps far away—that resulted in them either fleeing to Earth, or being expelled to Earth. Prison authorities would likely attempt to engage the prison population in activities and belief systems that would sap their energies and suppress their memories of who they are and where they came from. Such activities and beliefs would also prevent a revolt, and subsequent demands for restitution, reparations, and justice. This assumes that memory across separate timelines is normally possible in the previous environment. 1. 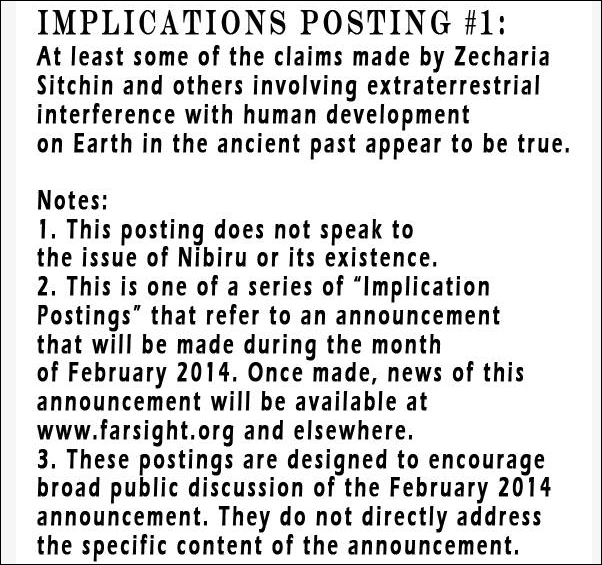 This is one of a series of “Implications Postings” that refer to an announcement that will be made during the month of February 2014. Once made, news of this announcement will be available at http://www.farsight.org and elsewhere. I’m going to put a note in the one I posted earlier, but first I want to make sure there is only that one difference. I’ve read it several times and that’s the only difference I can find. I see that the correction is that he replaced the word “help” in the one I posted earlier, with the word “also” in the news letter you got. I didn’t catch any other difference than what you noted. Below is the latest Implications Posting #14. As you can see, the major announcement is approaching soon. Again, this announcement does not refer to any cataclysms, Earth changes, second comings, or other such things. It is just an announcement with information, but information changes worlds, and this is an important announcement that will make a difference. Also below is Vic Guiza’s latest Farsight Chronicles! An announcement that will explain the past and positively influence the future development of human civilization on Earth will be made on the Ides of March 2014. Me: this announcement is going to be good. I think Courtney and team are brilliant. Definitely listen to the replay of last night’s Coast repeat of Art Bell and Courtney Brown from Somewhere in Time. Good timing. I was having dreams about it afterward. A fabulous show, imho and I didn’t hear all of it. Thanks again Polly! I’m looking forward to it too! The first Blood Moon is in April 1014. Just a reminder concerning this coming announcement — Courtney has stated (my words) that at the time of the announcement it may or may not seem like a big deal but in the future, looking back, one will be able to see from that moment onward the course of humanity was changed. I don’t have time to listen to all of this right now. I’m not familiar with this man’s work so I don’t know if he is credible or not. I’ll put this here anyway and we’ll see how it goes. At about 22 minutes Paul Laviolette says that beginning as early as one week from now = March 11, 2014, to the third week of April / 14 ( + 2 more weeks) for this pass of the G 2 cloud could have something stripped off and there could be an “outburst”. 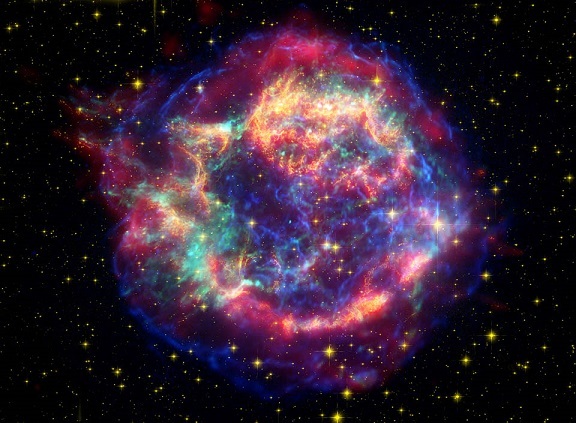 According to past records these cosmic rays have caused things on Earth, and the for dates he predicted, also they were not attributable to other causes. I’m not going to listen but I would love a superwave cosmic ray from the galactic core. I can’t think of anything better at the moment. I’ll get around to listening to the rest of the interview sometime. Many different things are happening / coming together in March / April. If any of these things have any truth to them, then something Very noticeable should happen! I’m not fretting about anything though. I have put my comment, and I will put future comments about Courtney Browns announcement comments in my Post for now. (I may do another Post in the future) so for anyone looking for Courtney Brown’s big announcement go to the link below and look in comments for updates etc. I am putting this here as a reminder to myself. John Lash mentions April 1, 2014. I want to see if anything (no matter what) notable happens happens that day. Download or listen. About 1 hr 4 min he mentions it..
March 12 2014. Only 3 days left until Courtney’s announcement. It says that on Far Sight Institute’s website too. This psychic had a ‘flash’ about the missing Malaysia Airlines Flight 370. Listen to the video for all the details. We’ll see how it goes. From under the YT video. An interesting explanation from the Cassiopean’s about prophecies / predictions and their interpretation.